Veteran blockchain enthusiasts understand that one of the most promising technologies in the space is Ethereum, and cryptocurrency investors also see it as a unique opportunity. With functionality as a payment solution and as a “decentralized computer”, many traders are looking to add it to their growing portfolio or to begin their investing journey with Ethereum. There are many ways to buy popular cryptocurrencies like Ethereum, but the easiest is with a credit or debit card, no matter your level of experience in the market. 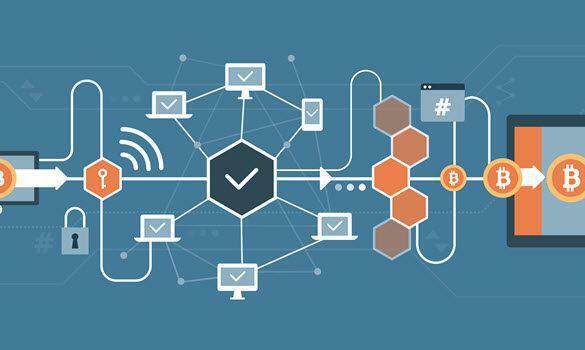 Blockchain technology has evolved several times in the last handful of years, and modern exchanges have figured out how to incorporate traditional payment solutions into their platforms. One can create an account, get a wallet, and buy Ethereum with their card within minutes. Whether they want to set up consistent buys and hold for the long-term, trade their ETH to gain exposure to the wider cryptocurrency market, or use it within a decentralized application, there are several great places to go. Coinbase is by far the most trusted exchange in North America and Europe, with several prominent VC backers, a headquarters in San Francisco, and a long history of reliable service. 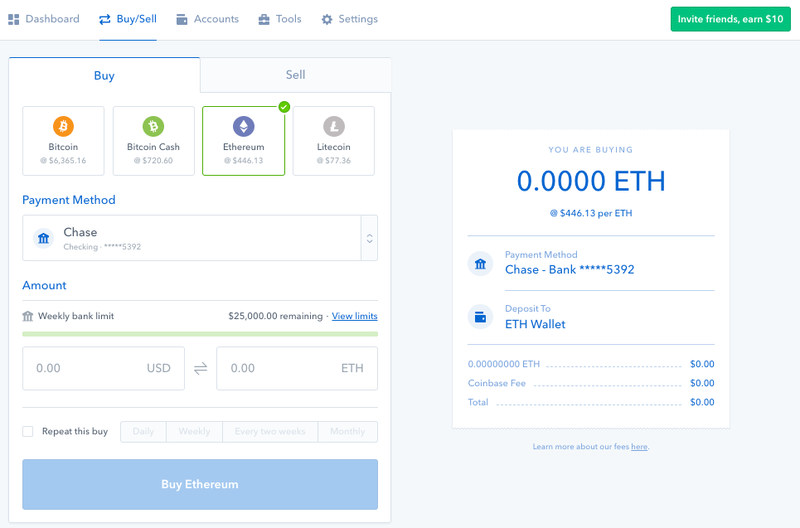 The exchange has two platforms, its professional Coinbase Pro trading dashboard, and a more basic interface on Coinbase.com, where enthusiasts can buy Ethereum with a verified bank account or a debit card. Some countries (and grandfathered-in customers) can use credit cards to buy cryptocurrency, but Coinbase recently suspended the addition of new credit cards to their platform. Coinbase also has a large institutional customer base and offers superior bulk storage with their Coinbase Custody platform. 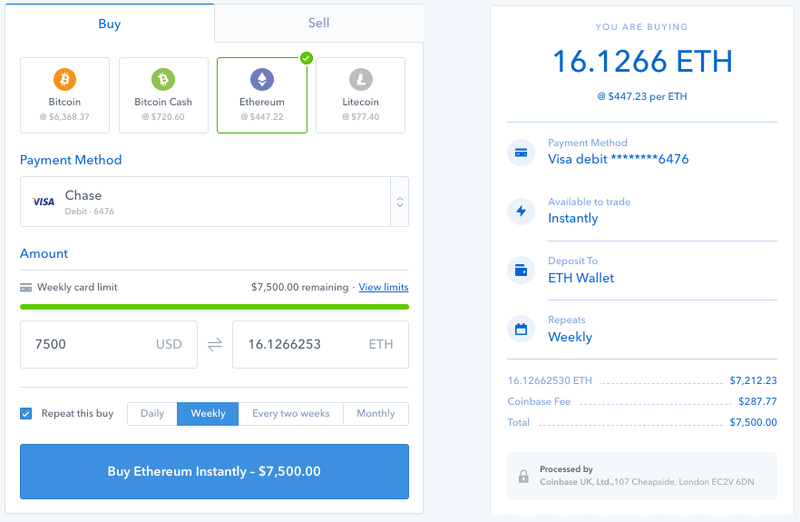 Click on Ethereum first, and then on the dropdown labeled ‘Payment Method’, where you can choose to link a bank account, do a one-time wire transfer, or add a debit card. 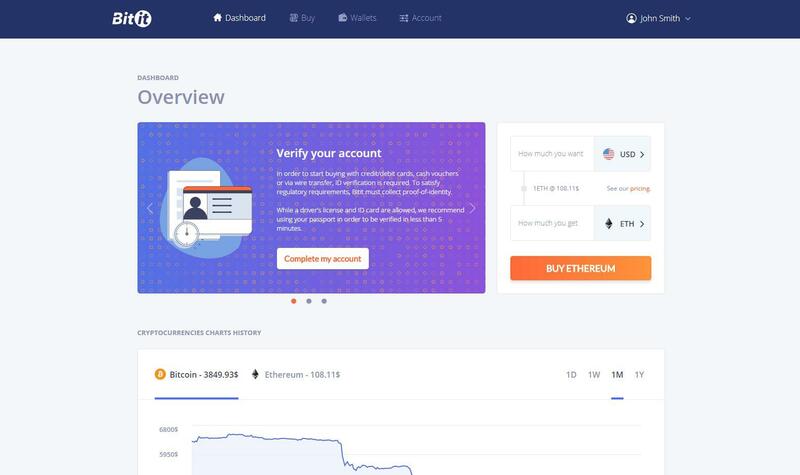 You’ll need to add the card before you can use it to buy Ethereum, but once you do, it’s saved in Coinbase’s system and can be used to purchase cryptocurrency on demand. Instant purchasing isn’t possible, but Coinbase gets close. 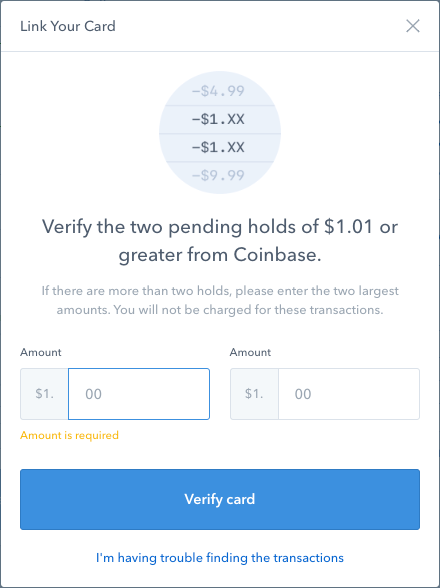 After receiving your debit card details, Coinbase will instantly send a small amount of fiat to your card’s bank account in three payments, and you’ll need to verify the two payments above $1.01 before using the card on Coinbase. To do so, enter these exact amounts in the window and click ‘Verify card’. The ‘Buy/Sell’ window now has your debit card as a purchase option. 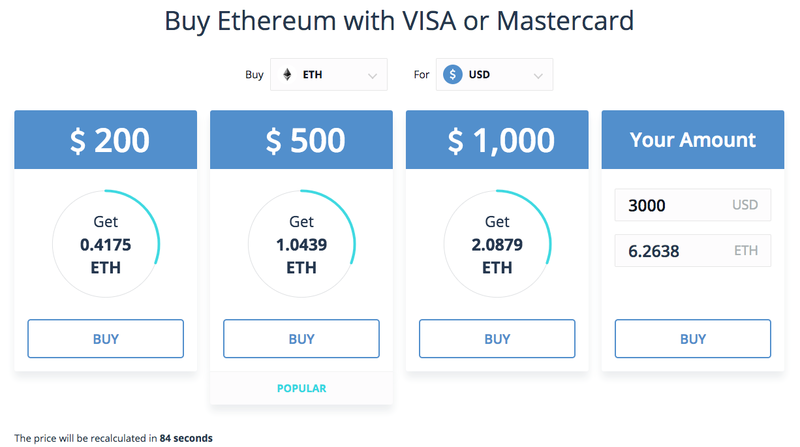 Select Ethereum, your debit card, and then choose the amount of ETH you want to buy (limit is $7,500 weekly purchases and $100,000 weekly withdrawals). You can set up automatic daily, weekly, bi-monthly, and monthly buys of any amount, if you wish. Fees for credit card purchases are standard at around 3.50%. Coinmama has customers from all around the world who can buy cryptocurrencies like Ethereum directly with their credit and debit card, and it remains one of the easiest portals into the crypto world. It supports over 188 countries and has millions of members, loyal since Coinmama’s founding in 2014. Though fees for credit and debit purchases are a bit higher than with its peers, and credit users will need to verify their identity, the exchange’s speed and awesome customer support make it a competitive option for investors everywhere. To get started on Coinmama, the exchange first asks you for a valid email address, your full name and country of residence. You’ll need to verify your email, and will then be required to verify your identity as well before buying any cryptocurrency. 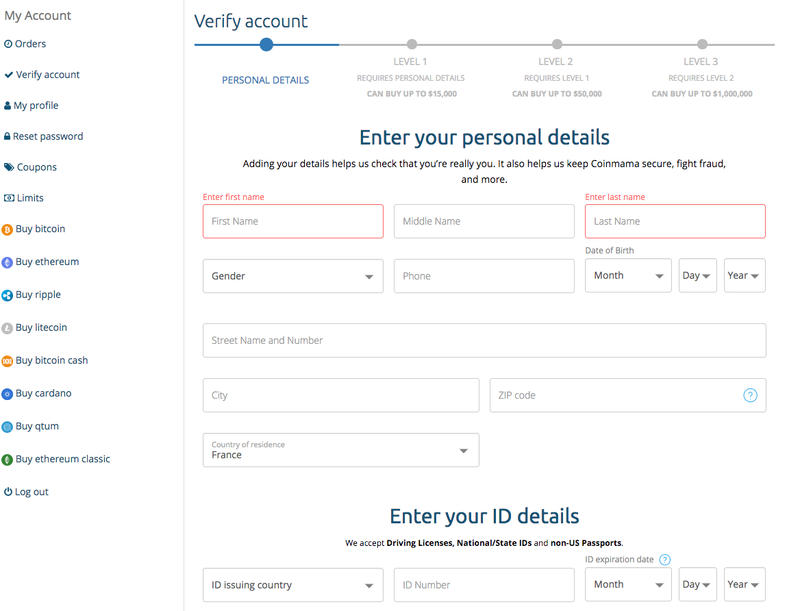 The ID verification page asks for some basic information like your name, current address, date of birth, and details of a valid government-issued ID (like a driver’s license or national social document of some kind). With so many countries to support, the Coinmama team needs to be capable of verifying documents in many languages and places of origin, and they can do so quickly. 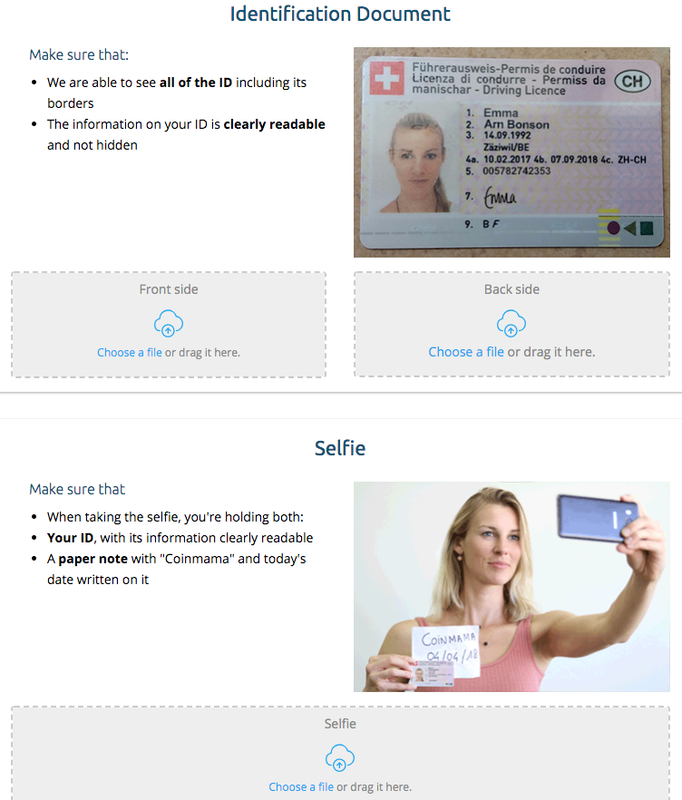 The exchange will ask you to upload an image of the front and back side of the ID you’ve chosen to verify yourself with. You’ll also need to take a selfie with your ID and a piece of paper with ‘Coinmama’ and today’s date written on it. 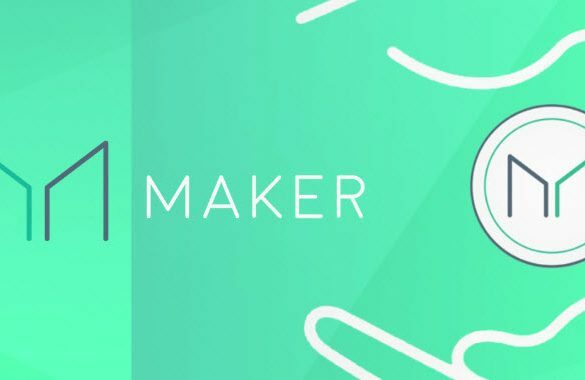 After uploading your images, you’ll wait around a week or so to hear from Coinmama and can then login to your Tier 1 account, attach a card to it, and begin buying Ethereum in amounts up to $15,000 instantly. After receiving Tier 1 verification, Coinmama’s ‘Buy’ links will stop forwarding you to the ‘Get Verified’ page and allow you to choose from a variety of preset buy amounts, or to enter your own custom amount. 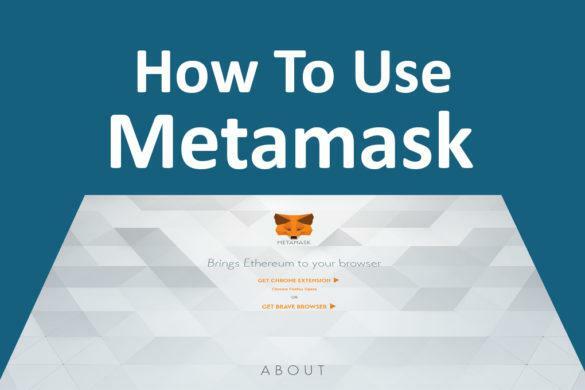 Click ‘Buy Now’ and then enter your existing Ethereum address, your card details, and watch the Ethereum hit your wallet in mere minutes. Changelly is a special, seamless web-based exchange that makes it uniquely easy to purchase ethereum, or to trade ethereum with another cryptocurrency. Everything is accomplished on their simple, comprehensively functional home page, instead of navigating the sometimes-complicated windows and processes of the traditional exchange format. One can simply click ‘Buy Ethereum with Credit Card’ to get started. You’ll then be presented with a screen where you can choose how much ETH to buy. Changelly’s $20,000 buy limit is great for those who don’t want to verify their information, yet still buy a lot of cryptocurrency. 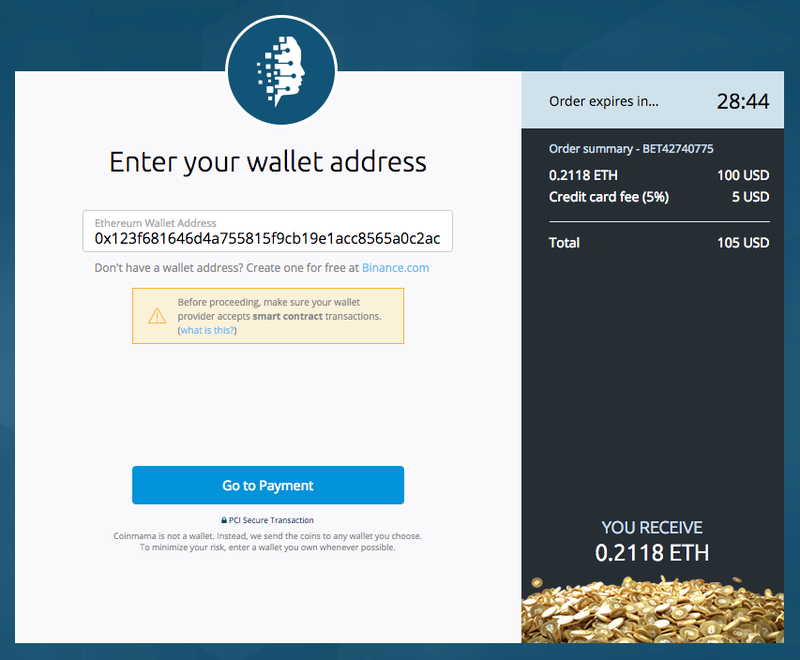 On this window, you’ll enter a valid Ethereum wallet address to send the ETH to post-purchase. Afterwards, just enter your credit card and billing information, click ‘Continue’ and go through the quick Payment and Verification steps. The ETH will arrive in your wallet per the blockchain’s current processing time. 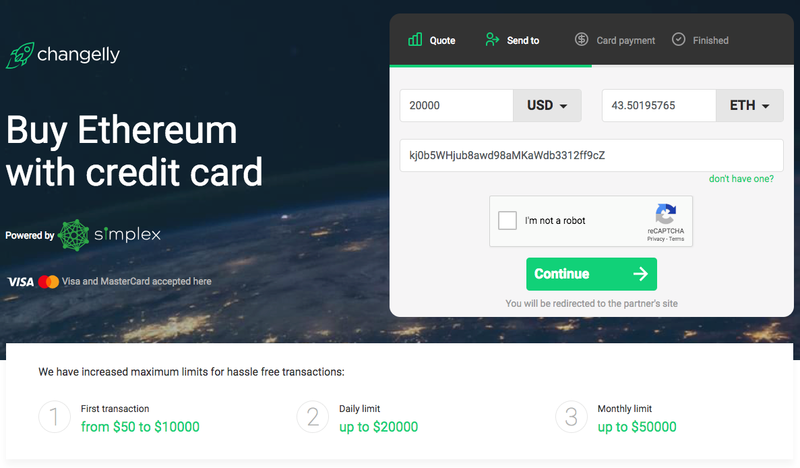 Changelly uses a third-party payment processing service called Simplex, which shows up on your bill as ‘Buyeglcom’, regardless if you buy BTC, ETH, or another cryptocurrency on Changelly. At 6.00%, fees are a bit on the steep side, but for such a convenient service this is acceptable. CEX.io is a great option for cryptocurrency traders everywhere, as the exchange supports nearly every country on the planet. However, customers from Africa and the Middle East will not be able to use their credit cards to buy cryptocurrency, just other payment methods. This includes Yemen, Saudi Arabia, Qatar, Pakistan, Oman, Nigeria, Libya, Kuwait, Iraq, Bahrain, Afghanistan, Algeria, Vietnam, and Iceland. In these jurisdictions, rules about cryptocurrency are not as mature, but everywhere in Europe and North America is fully supported. Signing up for CEX.io is simple, and requires a valid email address, Facebook account, or Google account. Afterwards, CEX.io requires that new customers verify their phone number, which adds another layer of authentication to the login process and increases security. Customers don’t need to enable 2FA, but CEX.io makes it clear that this isn’t recommended. You’ll then be presented with a window featuring several panels, each of which allow you purchase Ethereum in a convenient amount like $200, $500, or $1,000. It’s important to select Ethereum from the dropdown above these panels, and then the currency your credit or debit card operates in. Otherwise, your card will probably charge you a foreign transaction fee (on top of CEX.io’s fee). For custom amounts, simply enter the amount of money you’d like to spend, and the panel will illustrate the amount of cryptocurrency you’ll receive. 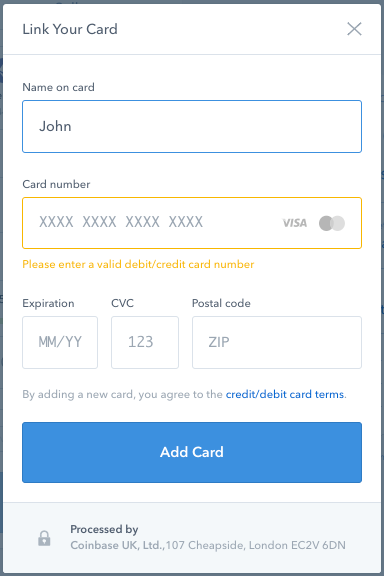 After entering the credit or debit card number you wish to use for the purchase, your full legal name, CVV code, and expiration date, you’ll be prompted to make the payment. 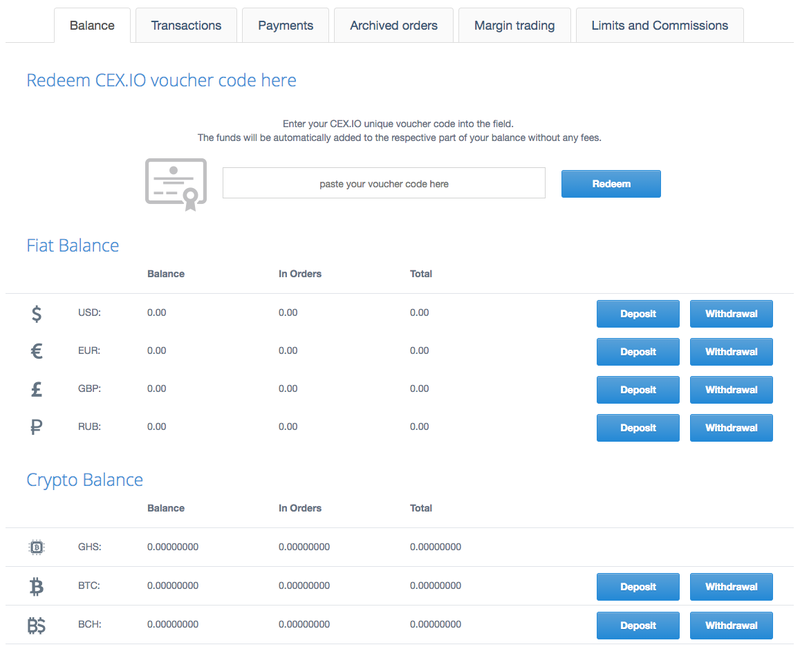 Once you click the button, you’ll see a new “Payment” entry in the ‘Finance’ tab of CEX.io’s website and, when the transaction clears, the appropriate amount of cryptocurrency in your wallet (on the same page). 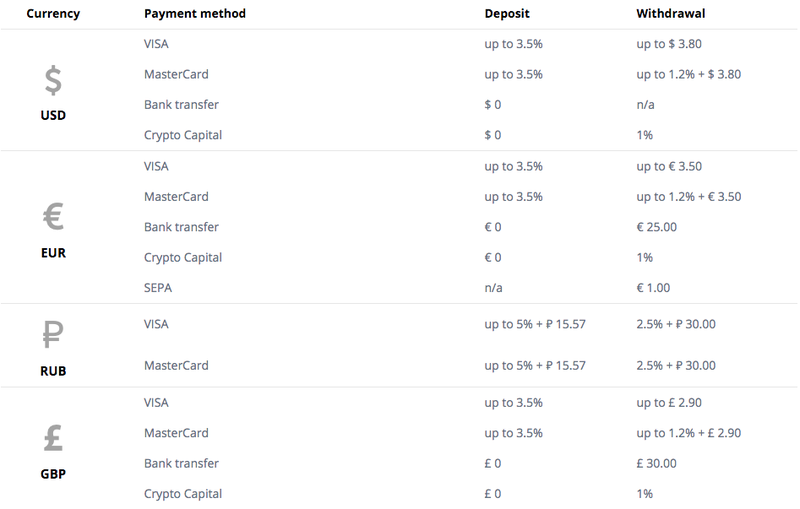 Fees on CEX.io are standard for card purchases, with a processing fee for deposits of up to 3.50% and a negligible fixed payment of up to $3.50 on withdrawals, depending on which currency you use. Purchase limits are $1,000 daily and $3,000 monthly for basic members, but verified accounts enjoy unlimited deposits and withdrawals on CEX.io. From its inception in 2011, Bitstamp was designed to be a more secure and reliable alternative to some of the existing cryptocurrency exchanges. 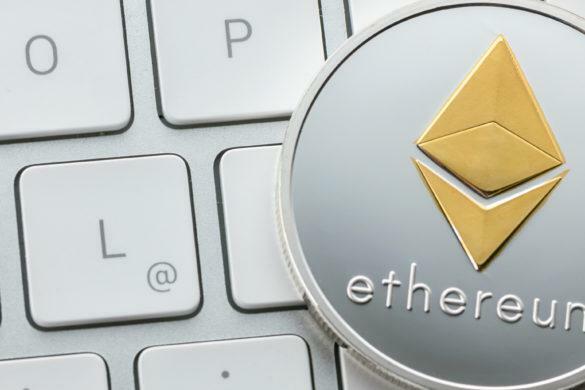 The company has since expanded and has grown into one of the most used and popular exchanges on the market, and still offers a fast and safe way to purchase Ethereum, and other cryptocurrencies, with a credit card or variety of payment methods. Regions Supported: Most countries, including all 28 EU member states, and the US. While instant credit card purchases are still limited to bitcoin on the company’s instant purchase page, you can deposit funds in fiat using your credit card to buy Ethereum. To do so, visit the Deposits page, select “Credit Card” from the menu on the left, and choose the amount you would like to deposit. Once that is set, provide your card details, press “submit”, and you should see the funds appear in your account. Although the 5.00% deposit fees are on the higher end of the spectrum for the market, there are no withdrawal fees, and your account is secured by one of the top exchanges available. Although it is a relative late-comer to the crypto scene when compared to more established exchanges, the France-based Bitit has quickly made a name for itself. The company’s easy and fast approach to purchasing cryptocurrencies with a credit or debit card (which includes all major card providers) and its secure infrastructure make it an appealing alternative for users of all experience levels. Getting started is quick and painless, as your registration only requires your name and email address, as well as setting your password. You’ll also be asked to fill in some details for your profile, such as your address and birthday. Once your initial profile is set up, you’ll need to verify your account by providing a photo ID to meet European Union regulatory standards. 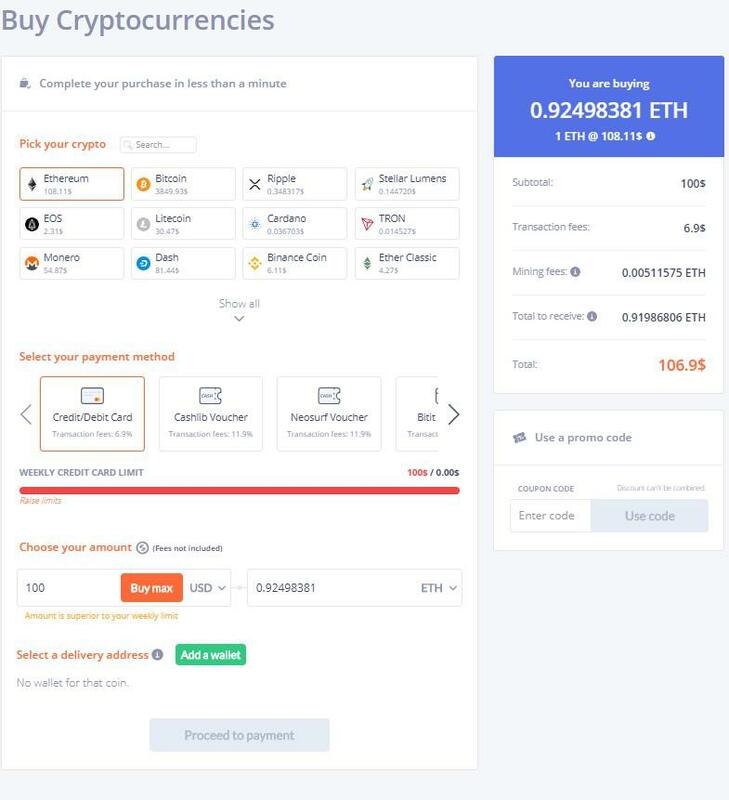 Once your account is verified and set up, you can purchase Ethereum with your card by selecting the appropriate coin on the box to the right and selecting “Buy Ethereum”. When you reach the purchase screen, you can select the details of your transaction. Select Credit/Debit Card, choose the amount you wish to purchase, and select a delivery wallet address. Once you have all these details included, simply select proceed to Payment, enter your details, and you’ll be ready to go. Bitit has among the highest fees for credit card purchases at 6.9%, but it offers the backing of an institution that is fully compliant and regulated with EU standards. As such, you can rest easy knowing that your information, financial details, and account are heavily guarded. With a straightforward interface and a strong foundation, Bitit is an excellent option for beginners and those looking to purchase Ethereum quickly. Choosing the right exchange for you comes down to understanding your needs and preferences. Depending on your desire for anonymity and privacy, exchanges that require fewer verification details and information may be optimal at the cost of some security. If you don’t mind higher fees, there are some exchanges, such as Bitit, that give you a reliable backing and fully compliant ecosystem to buy and sell your Ethereum.